The H2 Speed is billed as the world's first high-performance hydrogen car. GENEVA -- The H2 Speed concept unveiled today is Pininfarina's vision for a high-performance track car created in collaboration with Switzerland-based GreenGT. It is no ordinary track car. Named after the chemical formula for hydrogen gas, H2, the H2 Speed is powered by fuel cell technology developed by GreenGT, a Swiss company that has been designing, developing and producing zero-emissions propulsion systems since its inception in 2008. The company has been testing and refining its hydrogen technology program with European partners for the last two years. The H2 Speed is billed as the world’s first high-performance hydrogen car aimed at customers who value performance as well as environmental efficiency. It is neither a competition prototype nor a production supercar, though the vehicle is fully functional. Powered by two electric motors and a lightweight fuel cell mounted at the rear, the Pininfarina-designed rear-wheel-drive H2 Speed coupe is said to generate 509 hp, able to exceed 300kph (186 mph) and to accelerate from 0 to 100kph (0-62 mph) in a 3.4 seconds. A carbon fiber chassis derived from those of Le Mans Prototype (LMP) category racecars and composite body panels enable the car to weigh in at 1420kg. The exterior forms convey Pininfarina fundamental values of purity, elegance and innovation. 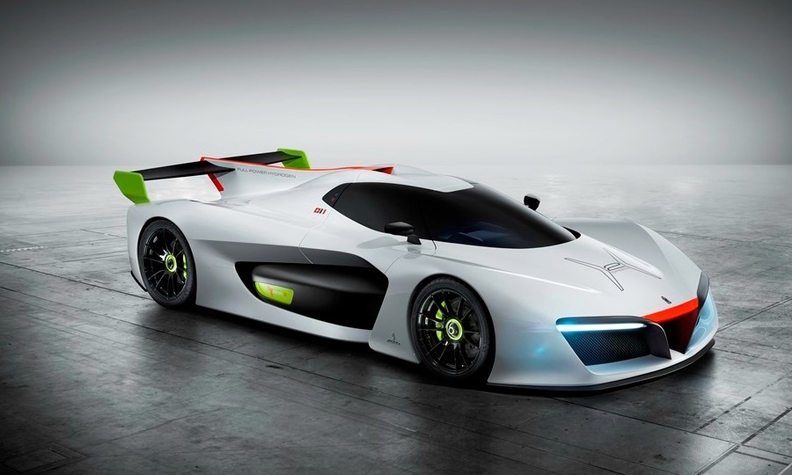 Pininfarina design director Fabio Filippini said his team was inspired by a racing car concept created by the Italian design house in 1969, the Sigma, as they sought to create an aesthetic that best represents GreenGT’s technology. The designers worked to create a pure form, free of unnecessary stylistic embellishment yet with strong emotional attributes. Sculpted by aerodynamics to increase efficiency, the H2 Speed combines the performance of its hydrogen powerplant with design elements specifically created to lend function to the form. The front end channels air through to the side creating downforce, while scalloped rear inlets feed cold air to the rear-mounted intercoolers. The Pininfarina H2 Speed will be produced in limited series. The company has not yet released details on price or delivery.